Arranging in plant training for students. Training to suit various needs of industry. Organizes training sessions on soft skill development. Inviting various organizations for campus recruitment. The Training & placement Cell is committed to provide all possible assistance to the students in their efforts to find employment. This commitment is demonstrated by the existence of a professor in charge. The Training & Placement service operates round the year to facilitate contacts between companies and our students. Staffs are available to respond to student's question and concern of their skills. This may include advice on placement procedures help with preparation of applications and resumes and practice for interviews. The aim is to ensure that students have the information and skills necessary for an effective job search. The Training & Placement Cell motivates the students by providing the necessary help & guidance for their career development and organizes sessions of aptitude tests, group discussion & guidance programme on how to face interviews. 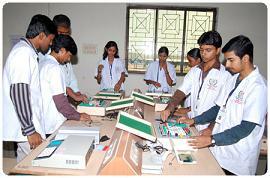 This cell also coordinates various activities related to the career of the students along with the industrial training.